Hub and I took a trip downtown (scary) to Word on the Street last Sunday. I’m not sure what Fiona Fairy was supposed to represent. She wasn’t anywhere near the children’s area but her ensemble certainly as eye-catching. Unfortunately, the organizers changed the layout. Instead of the main tents being located on the grass under the trees in Queen’s Park, they were jammed onto the street and, as a consequence, there was less space for audiences and the noise level inside was much more distracting. The booths stretched from Bloor Street all the way south to College Street, but there was less space to meander. 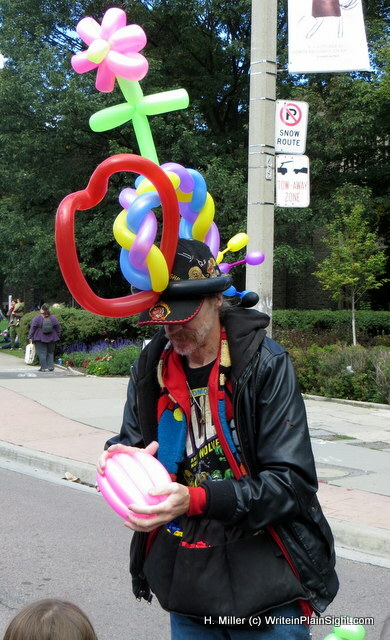 Balloon guy was doing a roaring business. Very creative constructions – not all guns for boys and flowers for girls. 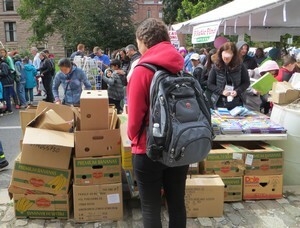 What was most noticeable among the vendors were the hundreds of primarily niche market self-published books on topics ranging from unique diets, fantasy creatures, religious tracts, unique personal philosophies, socialist and communist press and pet recipe books (how to feed your iguana). Marketing is hard at the best of times but some of those folks shivering behind their solitary tables were not selling much. Still, someone’s making money from their hopes. More eating than book buying – lots of Asian, Thai, hamburger, hotdog and soft ice cream vendors. Unfortunately, the place reminded me more of a street market in Thailand than a celebration of books and writers. Even established publishers like Prentice-Hall and Harper Collins had tables overflowing with books at 20% off. The thing is (and I’m not ashamed to say it), I’d rather have my books clean, thank you very much, and not dog-eared from hordes of bargain hunters thumbing through the pages. Besides, I prefer going online instead of elbowing past large dogs, loungers and car-sized strollers to see the selection on offer. Lots of high anxiety decorative dogs with turquoise coats, Burberry vests and blingy collars. I felt sorry for the little critters having to navigate the thicket of feet and wheels on the streets and being yanked away from sniffing dropped food. People, people – does your dog help you shop for books or do they read by themselves? It was a disappointing experience. Perhaps WOTS has ‘jumped the shark’ or lost it’s energy and creative vision?